Chatteris' own Annie Rose Benzie on her eventful trip to mainland which featured a questionable 'spa' trip and a bike ride that could have been a comedy sketch. When someone says ‘China’, it is easy for the industrial sites and high rise buildings of Beijing and Shanghai to come to mind. However, look a little closer to home and there are so many places to escape the Hong Kong (HK) hustle and bustle. In no time, you can be relaxing amidst the beautiful and natural wonders of mainland China- and what better place to do this than in Guilin? As it was the first long weekend of the year, we knew we wanted to escape the city on a budget. Being just 3 hours away, Guilin was instantly attractive. From HK, we hopped on the MTR to Lo Wu and strolled across the border into Shenzhen, visa at the ready. During our 10 hour wait to catch the early morning train, we decided to ditch the hostel and opt for a night at the Queen’s Spa- a 24-hour spa offering a strange variety of treatments. Firstly, we noticed nobody spoke English, which soon become a recurring theme of the weekend...Only one poor man in the building could say “hello” and so he was forced to follow us around for the evening, checking we were still alive. We were given electronic wristbands before being ushered through different floors of the spa, having to drink hot water and shower along the way. Finally, we settled down to sleep in a room with a hundred people, all wearing matching pyjamas. After what can only be described as the strangest night of our lives, we made our way to Guilin and travelled through the unique landscape of the surrounding area. 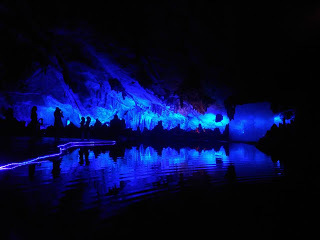 Once at the hostel, we wasted no time before jumping on a bus to the Reed Flute Cave, famous for its stunning stalactite light displays. When we resurfaced, we wandered around the area for a few hours, happy to be soaking up the sun and breathing some fresh air. As afternoon fell into evening, we continued exploring the central part of town including the symbolic pagoda temples. However, it seemed that we were the main attraction as at least a dozen people stopped to stare and take photos of us. It’s funny how different the culture can be, even being so close to Hong Kong. 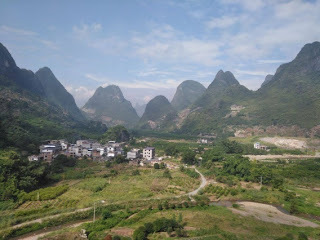 On day two, we decided to travel to the Li River, which took around 3 hours by bus. The first challenge we encountered was discovering that all bus timetables and tourist information was only available in Mandarin. On our quest to find the right bus, we ended up being shoved onto a random mini bus and pushed to sit awkwardly beside the driver. 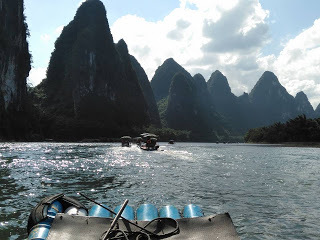 Just as we accepted our fate of possibly ending up on the other side of China, we arrived on the bank of the Li River, which totally exceeded all expectations. Although the journey was stressful to say the least, the image of the famous Karst Mountains will stay with me forever- a view you can’t see anywhere else in the world. To top off a perfect day, we bought a few beers, rented a “Chuckle Vision” bike and cycled up to a viewing platform to watch the sunset. As if the locals weren’t looking at us enough already, the image of us cycling that bike on the main road definitely gave them more reason to stare! Above: Enjoying the 'Chuckle Vision' bike ride! 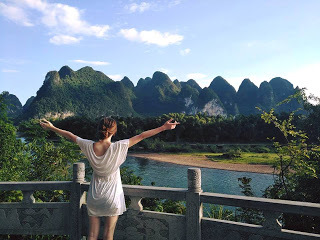 So if you’re getting itchy feet in HK and have a few days to spare, Guilin is your place. It’s beautiful and seriously cheap. We stayed at the Greenforest Hostel which only set us back $50 HKD a night and transport in the area is around $1 HKD per journey! 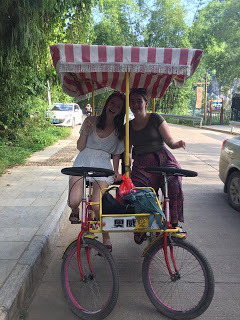 I would recommend going for 4 days to fit in all the top sites- particularly the Li River, caves and the Rice Terraces (which unfortunately we had to miss). My top tip would be to plan your trip before you go. Make sure to bring maps, bus timetables and sort out a sim card in advance because unless your Mandarin is up to scratch, getting hold of any of these would be a struggle. Oh, and be careful- once you go, you’ll never want to leave.